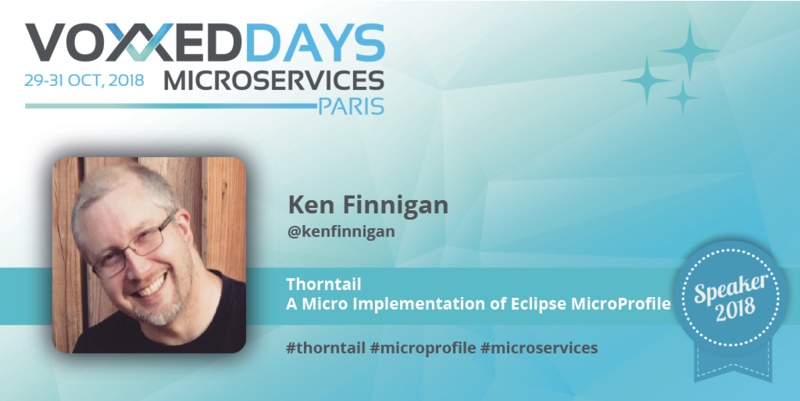 Check out this interview with Ken Finnigan who will be talking about Thorntail, which he is co-founder and lead of, focusing specifically on the pieces it implements from Eclipse MicroProfile at Voxxed Days Microservices in Paris this October. Hi Ken, tell us who you are and what led you into microservices? I'm a software engineer that's worked for many enterprises all over the world, though currently, I work for Red Hat developing Thorntail. As the co-founder and lead of Thorntail, formerly WildFly Swarm, I've had the opportunity to delve into microservices from the framework side of it. Doing my best to make developing microservices easier with Thorntail for all developers out there. As part of that, I have been involved with Eclipse MicroProfile since its inception. Working in the community, on specifications, and also implementing those specifications in Thorntail. At Voxxed Days Microservices I will be talking about Thorntail, but focusing on the pieces it implements from Eclipse MicroProfile. During the presentation, I will briefly discuss the different specifications that are currently part of Eclipse MicroProfile and how they can be used to simplify microservices development in Java. Then it's time to dive into a demonstration of the specifications implemented in a set of microservices using Thorntail deployed to a Cloud. Back in 1998 in J2EE 1.2 we were already distributing components, doing failover, load-balancing, clustering, high-availability, using binary protocols... aren't we reinventing the wheel? What's new with the Microprofile? That's definitely one thing we do well as software engineers, reinventing wheels, though maybe with a different look or style to them. It's also the case that the wheel changes where it is on the car! By that I mean we're seeing a trend to move cross-cutting concerns like load-balancing, failover, etc out of application code and into infrastructure components. Service Mesh and Istio, in particular, is an example of this change. Even though more aspects are pushed down the layers into infrastructure, it's still necessary for Eclipse MicroProfile to provide a means to offer these features for environments where that infrastructure isn't present, but then have a way to deactivate or integrate with a Service Mesh when it is. Good, see you soon then! I'm excited to be taking part in the first Voxxed Days Microservices, and look forward to discussing microservices in detail with speakers and attendees alike. See everyone there!